Awesome tutorial. But I thought lock backs were suppose to be easier than liner locks. That dont look easier ! Im trying to make my first lock back. This was great. I'm new to knife making and prefer folders for EDC's. I feel like I could make one now, well minus the milling since I'm using hand tools. I may have to check out the book you recommended. I may have to check out the book you recommended. The book shows how to make a lockback with hand tools. Mr Keith Johnson - that is a GREAT WIP on lockbacks. Thanks to you, one of my goals for 2014 is to make a lockback folder! Go for it Ken. If you have any questions just ask. Awesome build, I'll be referring back to this one often. Thanks for doing this. Keith thanks for your time on this, this is on the bucket list of attempts this year !!! great wip and thank you sir !! Mr. Johnson, Great WIP. Thank You for demonstrating the head spinning. Thank you Mr. Johnson. I needed that! You are most welcome! Don't be afraid to ask if you have questions. Thank you for this excellent pictorial. I'm walking into the realm of slipjoints, as it appears I don't have enough stress in my life right now:3:, and this thread has been a terrible instigator. A question, if I may - what size endmill are you using to cut the relieve the liners? I'm guessing .500", but I'd rather not guess. Is there anything you use to determine how much relief you need, width wise? Is the only factor the size of ricasso and bearing surface of the blade? Matt, you got it right. 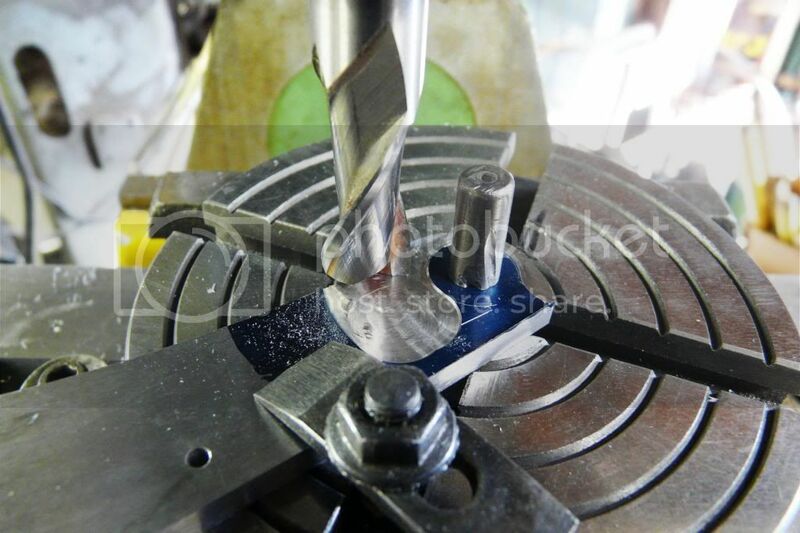 I use end mills anywhere from 3/8" to 1/2" so the relief will accommodate the entire flat area from the tang to the plunge. Thank you much! Although I think a slipjoint will be the first order of business, for me, there's no doubt I'll need to follow your lead and attempt a lockback. On a side note, would you mind relating how you've developed your patterns and styles? Did you start with a classic or a traditional model from somewhere, and spin off from there, or did you begin from scratch? Since I already had patterns for slipjoints and I wanted to make a lockback, I needed to know exactly how the lock functioned so I bought the book mentioned in post #1. After studying how to design the lock it was a matter of adapting that to traditional patterns. As for the slipjoint patterns, I've drawn patterns from scratch and I've taken old knives apart to trace. I've also asked other knifemakers for patterns and they have always been very accommodating!